Suzie and James masterfully show that happily ever after doesn’t come from a perfect, problem-free life. Rather, it comes from knowing how to adapt with your partner to the range of joys and adversities we all experience. 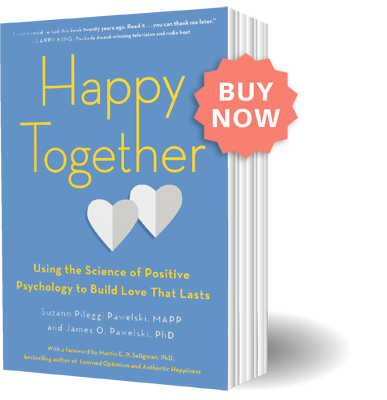 Weaving together empirical research, philosophical wisdom, and real-life examples, Happy Together demonstrates the central importance of emotional agility for romantic relationships—and shows you how to cultivate it with your partner. –Barry Schwartz, bestselling author of The Paradox of Choice, Why We Work, and Practical Wisdom with Kenneth Sharpe. Suzie and James have knocked it out of the park with a practical guide to lasting love. I highly recommend this book to anyone who wants to know the real keys to a happy, fulfilling relationship, backed by years of research.